Japan. Zen Buddhist Master. (1200-1253 AD). "As I study both the exoteric and the esoteric schools of Buddhism, they maintain that human beings are endowed with Dharma-nature by birth. If this is the case, why did the Buddhas of all ages�undoubtedly in possession of enlightenment �find it necessary to seek enlightenment and engage in spiritual practice?" "Zazen is not "step-by-step meditation". 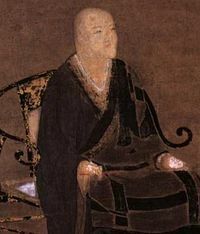 Rather it is simply the easy and pleasant practice of a Buddha, the realization of the Buddha's Wisdom. The Truth appears, there being no delusion. If you understand this, you are completely free, like a dragon that has obtained water or a tiger that reclines on a mountain. The supreme Law will then appear of itself, and you will be free of weariness and confusion." "Thinking that practice and enlightenment are not one is no more than a view that is outside the Way. In buddha-dharma [i.e. Buddhism], practice and enlightenment are one and the same. Because it is the practice of enlightenment, a beginner's wholehearted practice of the Way is exactly the totality of original enlightenment. For this reason, in conveying the essential attitude for practice, it is taught not to wait for enlightenment outside practice." "Fifty-four years lighting up the sky. Living, I plunge into Yellow Springs"